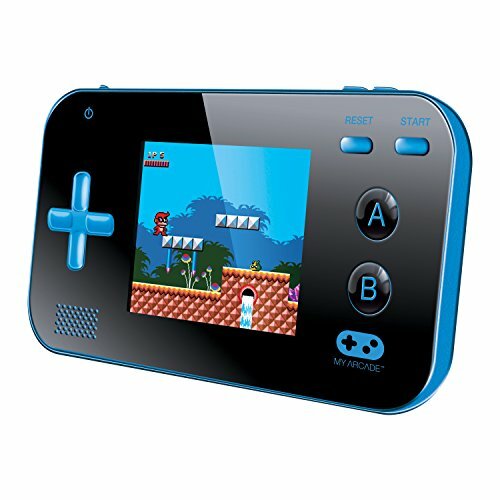 Preloaded with 220 retro style games - turn on the power and start playing! Storm the castle, soar the skies, solve puzzles, play your favorite sport or race for the checkered flag and many, many, more. 2.4" Crystal Clear full color LCD screen, backlit for play virtually anywhere. Perfect for all ages - simple arcade style controls, easy to use and quick to master. Convenient size and lightweight - Perfect for travel or on the go. Even includes a volume control so mom doesn't lose her mind! Requires 3 AAA batteries (not included) for hours of continuous fun. Soar the skies, solve puzzles, play golf or tennis, and much more. Gamer V is loaded with 220 fun and easy to play videogames! Simply power on the system and start playing, anywhere, anytime! The gaming system is perfect at home, in the car, or just about anywhere you can imagine! Gamer V Fits easily in your pocket, purse, bag or backpack so you’ll always have your games at your fingertips.